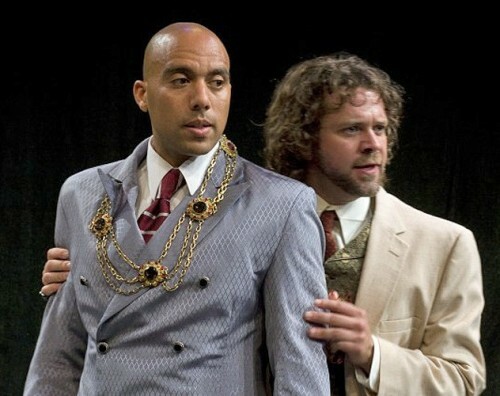 The Duke and Angelo (Tom O’Keefe (R) and Gabriel Portuondo) in Measure for Measure. Production photos are by Danny Kurtz. Aaron Sharff, Poornima Kirby, Gabriel Portuondo, Alison Novelli in Measure for Measure. Emily Hagburg and Gabriel Portuondo as Isabella and Angelo. As Lucio, Nathan Wolfe Coleman is the essence of nefarious intent. Poornima Kirby is a touching Mariana. 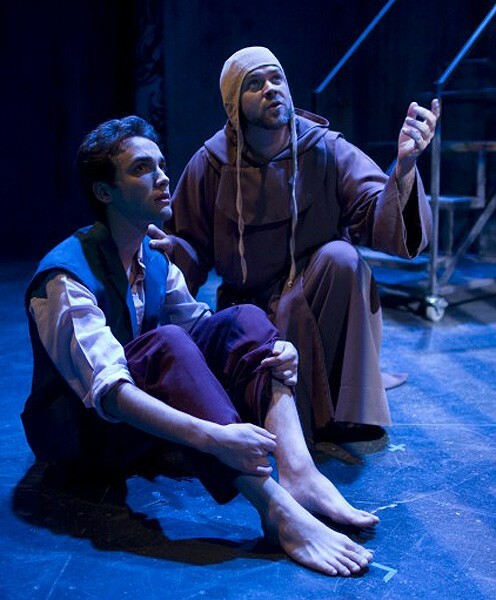 Ross Bennett Hurwitz (l) plays the victimized Caludio and Tom O’Keefe the Duke, disguised as a Monk. 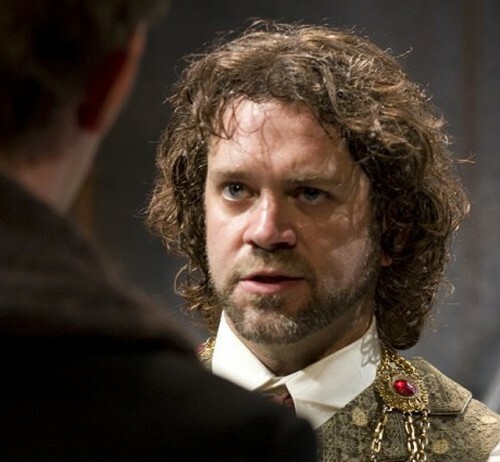 Tom O’Keefe is the backbone of Measure for Measure, as the Duke of Vienna and disguised as a Monk who observes how his servants actually conduct his business. Tom O’Keefe is a wonderful Duke of Vienna. Measure for Measure by William Shakespeare, Directed by Dave Demke, Set Designer - Kiki Smith, Costume Designer - Kelly Marie Schaefer, Lighting Designer - Greg Solomon, Sound Design - Ian Milliken and Dave Demke, Songs by Iann Milliken, Stage Manager - Victoria Sheehan. Original music composed by Composition Fellows of the Tanglewood Music Center - James Borchers, Jung Sun Kang, Elena Langer, Wang Lu, Andreia Pinto-Correia, Cynthia Wong. Cast: Nathan Wolfe Coleman as Lucio/Abhorson, Emily Hagburg as Isabella, Ross Bennett Hurwitz as Claudio/Froth/Varrius, Emily Karol as Provost/Fansisca/Elbow, Poornima Kirby as Mariana/Angelo's Servant, Allison Novelli as Juliet/First Lady/Justice, Tom O'Keefe as Duke of Vienna, Grabriel Portuondo as Angelo/Mistress Overdone, Aaron Sharff as Pompey/Friar Thomas, Michael Dix Thomas as Escalus/Bernadine. At Shakespeare & Comapny Elayne P. Bernstein Theatre, Lenox, MA. July 10 to September 5, 2009. About two hours and a quarter plus a fifteen minute intermission. Shakespeare & Company has brought back its Lunchtime Shakespeare series, last enjoyed during its tenure at The Mount many years ago. 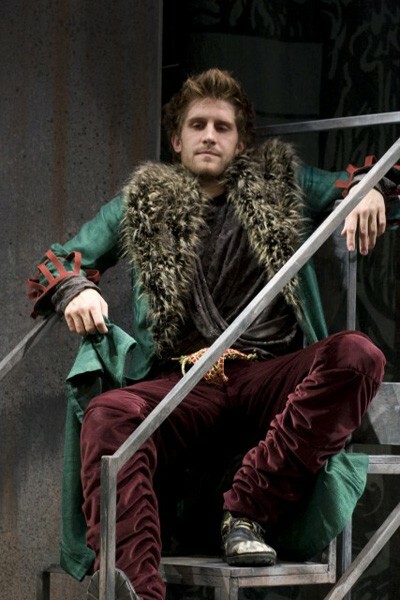 It is a full-blast, full-bore production of Measure for Measure that delights, and wearies at the same time. It is far too long for a "lunchtime" offering whose very name would suggest a work of more moderate length. If you took a lunch hour this long, you would most likely be severely chastised, if not fired. This is not to take anything away from this production, nor the concept of doing theatre in the daytime as well as at night. Measure for Measure is a morality play, though under the sure hand of director Dave Demke, the cast has been given more liberty than usual to ham it up, enjoying pratfalls, Keystone Cops chases and Three Stooges whack-a-mole moments between the lessons the play is meant to convey. Indeed it is difficult discerning whether or not to take this classic seriously. The players are drawn from the S&Co Performance Internship Program, with a cast that is comprised of energetic and talented young actors who show a great deal of professionalism under their comic demeanor. Without exception, their diction delivering the convoluted language of Shakespeare was crystalline in delivery, and generally on the mark in emphasis. The clarity of the actors is but one telltale sign of the company's famed educational methods. 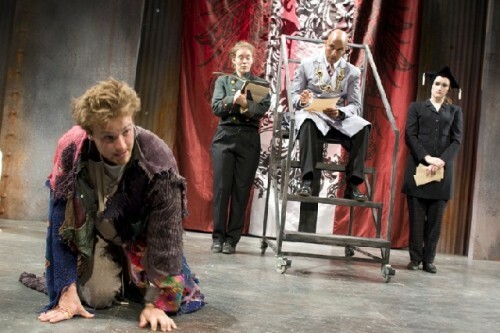 Measure for Measure recounts the story of a benevolent Duke (Tom O'Keefe) who places the responsibility of enforcing the laws in the hands of his trusted Angelo (Gabriel Portuondo) who turns out to be harsh and hypocritical, using his power to bed the sister of a condemned prisoner. Some rise by sin, and some by virtue fall." The comparisons to contemporary politics is undeniable, what with our current holier-than-thou moral midgets flouting the very sexual peccadillos they condemn so harshly. 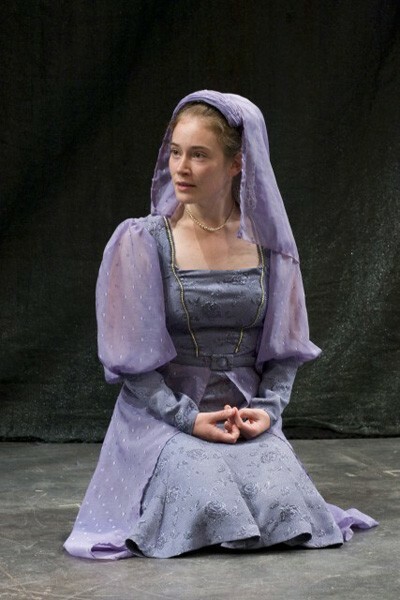 In the play, nobody loses their virginity, however, since Shakespeare employs his "bed trick" device, and with complicated plot twists sees to it that "all's well that ends well." One of the delightful aspects of this production are the musical interludes which open the play and are repeated several times throughout the course of its unfolding. The Composition Fellows at Tanglewood have contributed music that is appropriate to the period, and it is well sung. In fact the singing in most of the Shakespeare & Company productions this year has been a vast improvement over last year's less successful efforts. The rapidity with which the play unzips makes up for its unfortunate length, and Dave Demke utilizes the zeal of his youthful actors in a hundred clever ways. Part of the fun is the many role reversals of women playing the jailers, provosts, guards and men playing wanton women. It is all simply hilarious. The men play at being women, and the women in turn play up the goofy aspects of being a macho prison jailer. Perhaps the most fetching reading of the entire show was delivered by Pompey, played by Aaron Sharff. There were layers of meaning underpinning his lines, visible in the way he used his body, his props, and most expressively, his face and especially his eyes. While his Pompey was ribald and rich, his Friar Thomas (all the actors doubled and tripled roles) was plain and simple. Clearly this is one theatrical shaman who has a bright future ahead of him. His equal on stage was the brilliant Tom O'Keefe who played both the Duke of Vienna and disguised himself as a simple monk, thereby witnessing the treachery being unleashed in his name. Of course, none of the major actors could shine without the sturdy performances of the minor characters, most notably Emily Hagburg as a heart breaking Isabella and Poornima Kirby as Mariana. In the role of Angelo, Gabriel Portuondo did a serviceable job, though his moments as Mistress Overdone were the most fun. The evil Lucio, as portrayed by Nathan Wolfe Coleman was appropriately repulsive, but had an ironic streak that endeared him to many in the audience. He set out to prove what fools these morals be (sic) and succeeded. Some months ago artistic director Tina Packer explained that this season many of the productions would be "bare pipes" undertakings, with simple sets which depend on the actors to carry the show. Here she more than proves her point. The sets were little more than a few drapes, a set of industrial stairs and other odds and ends, yet with the magic of lighting and simple pulleys and hooks, they worked wonderfully. The sound design also helped to fill out the feeling of complexity by adding an aural fourth dimension. Yes, Tina, with great actors, you can skimp on the decorations. All of the Berkshire Theatre companies have Apprentice and Intern programs each summer, and it always is a delight to see how each new group of young actors is doing. How wonderful to see these talented people on stage, with real roles, getting real applause from real paying audiences. You owe it to yourself to take in this production. Tell the boss you're taking an extra long lunch this week. And eat well before the curtain goes up. It's a long one.